When there's a problem with your water heater or boiler systems, you can count on our professionals to help keep your minor inconvenience from becoming a major problem. At Frank's Mr. Plumber, we have some of the most experienced technicians in the industry working around the clock to help ensure quality service and a friendly smile, even when the unexpected happens. Whether you need routine maintenance of your boiler system, or are facing a major repair, we're there to help. There are few things more valuable than reliable service, and in this day and age, we understand that lost time equals lost productivity, comfort, and convenience. In fact, waiting on a repair can often lead to more extensive damage than the original problem, costing you hundreds, even thousands in additional fees. With 35 well-serviced, state-of-the-art trucks ready to go when you need us, we're the most dependable name around. If your boiler systems are proving to be a major headache, let us take the stress and worry out of your situation. A simple phone call to the skilled team at Frank's Mr. Plumber is all it takes to take back control of an unpleasant situation, saving you time, money, and most importantly, providing you valuable peace of mind. In addition, we offer a 5-year warranty on parts and labor, making us the obvious choice. Call today for your free consultation! Imagine all the hot water you need - WHEN you need it - with lower energy bills! If your hot water demand doesn't exceed running a shower, washing dishes and doing the laundry, our tankless water heaters will deliver all the hot water you need without running out. 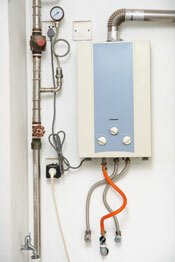 Conventional water heaters continually heat and reheat the water stored in the tank. Our new tankless water heaters heat only the water being used. Now you can pay for only what you use and stop paying for what you don't. Tired of waiting for water to get hot? In less than two hours, Frank's Mr. Plumber can install a comfort pump and timer that will give you instant-on hot water at every faucet in your house. The comfort pump uses less energy than a 25-watt bulb and can save you up to 10,000 gallons of water per year! For details, just call Mr Plumber. In Western New York, Frank's Mr. Plumber services Buffalo, Lockport, Tonawanda, North Tonawanda, Niagara Falls, Lancaster, Hamburg, Amherst, Depew, Grand Island, Orchard Park, East Amherst, East Aurora, Grand Island, Lewiston, Getzville, Clarence, Lackawanna, and nearby areas.